If you're hankering for a cheeky Caribbean island break that promises guaranteed sunshine without the sticky humidity then look no further than Aruba which is all about warm days spent outdoors followed by chilled out nights sampling the grub and tropical cocktails. As Aruba is only 20 miles long and around 70sq miles in area, it's pretty straight forward to get around and anyone interested in easy-going gradients will be pleased to hear that the highest point on the island (Mount Jamanota) is just over 600 feet so more than doable on a day hike. Aside from the hill walks, Aruba is famed for its fabulous beaches and you'll find more than your fair share of 'screen saver' moments to fill your camera's memory and then some. Of course, just lazing in a hammock or continuously whispering 'this is the life' can only go so far and taking the plunge into the sumptuous shallows of the Caribbean presents no end of water-based activities to help you pass the time. 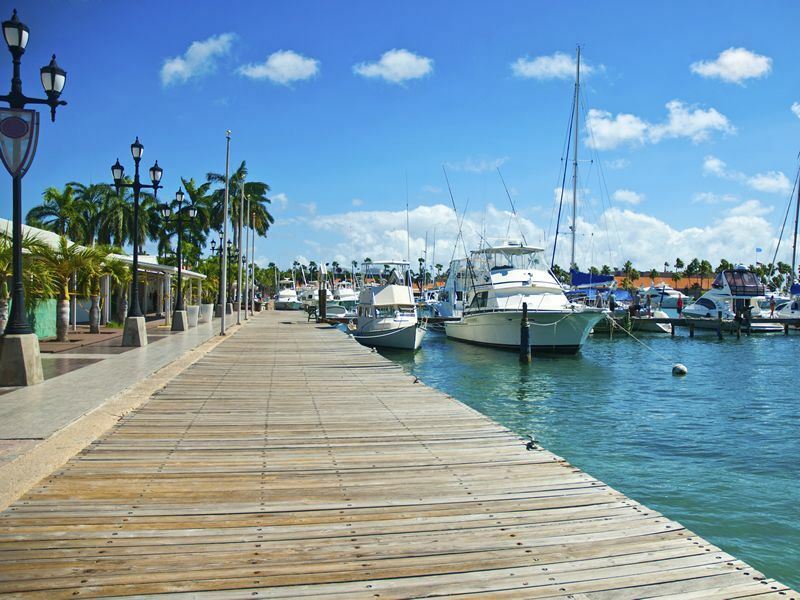 Away from the pristine white sand beaches and swaying palm trees you'll find that Aruba, especially the capital city of Oranjestad, contains some excellent examples of colonial architecture of which, as the name suggest, the Dutch had no small part in building. Fort Zoutman (and the adjoining Willem III tower) is definitely one of Oranjestad's highlights as it's the oldest building of its kind in the whole of Aruba and now serves as a museum full of fascinating facts about the island's history and heritage. If history's not your thing or you've ticked the cultural box already then there are numerous alternative ways to spend your day with air-conditioned malls, designer boutiques and tax-free bargains galore always providing plenty of temptations for those who live to shop. The island's tax-exempt status makes it an absolute magnet for shopoholics however, make sure you take your time to explore and browse around some of the flea markets and street vendors to get a real flavour for the local arts and crafts. Once you've enjoyed your day doing whatever you darn well feel like doing then you'll no doubt have worked up an appetite for a tasty Caribbean treat and if you're looking for a quick pick me up then try the Cool Island Soup and you'll feel refreshed and revived in no time at all. Other Aruba 'must tries' include: sopi di pampuna (pumpkin soup), kerikeri (fish stew) and keshi yena (Edam cheese stuffed with meat), all of which will help you ease you into the evening or assist in an afternoon of snoozing in your favourite deck chair. So, if you think that Aruba is going to tickle your toes then there's only one thing left to do and that's go and explore for yourself. And, if you're wanting a few more nudges in the right direction, check out the top 10 things to do in Aruba below that will have you on that plane and singing - 'Aruba, Aruba, here we come!' from the moment you take off. Once you've got over the wealth of beaches, romantic locations and historic sites that Aruba has on offer then there's just one thing left to do and that's hit the slots! Palm Beach and Oranjestad are the island's gambling capitals and you'll find more than 10 different venues to win, lose or break even so make sure you only spend what you can afford to leave behind. Blackjack, poker, baccarat and roulette, you name it and in Aruba you can play it and if you're looking to stay up all night then the Crystal and the Seaport casinos are open 24-7 so make sure you stay focused and have a good time before you eventually emerge blinking into the sunshine. Note: It's still ok to smoke inside in Aruba's casinos and although drinks are 'complimentary' you will have to be seen to be adding to the house pot so don't be surprised if your waiter doesn't return if you're not feeding the slots or tables. There's always a reason to get all warm and mushy in the Caribbean and whether it's the kiss of the sun or the sensuous lapping of the ocean waves, you'll never be far way from romance on a trip to Aruba. This is one of the top honeymoon hot spots on Earth and you'll find a massive range of hotels, retreats and two-person hammocks to ensure you're treated like Wills & Kate with welcoming smiles pretty much guaranteed no matter where you're thinking of making your base. Sunset strolls along white sand beaches, tropical cocktails laden with fruit and plenty of intimate hideaways to unpack a well-prepared picnic make Aruba an essential box ticker on the romance scale. And, if you're hoping to pop an oh-so-important question, what better place to make your wildest dreams come true? Located on the east coast of Aruba and featuring more cacti than a Spaghetti Western, the Arikok National Park is the island's premier protected area of natural loveliness and well-worth a visit if only for a day at the beach. Loads of limestone caves and hillsides present lots of excitement if you're visiting with young explorers and the chance to see nesting turtles in Boca Prins is a definite must for all wannabe botanists and conservationists. Wildlife is pretty sparse although snakes, lizards and parakeets can often be spotted, especially if you're contemplating a hike up to the island's highest point at the summit of Jamanota (around 600ft). Ruined plantations, abandoned gold mines and ancient paintings made by the indigenous Arawaks tribe make Arikok National Park as educational as intrinsically beautiful and visit to the conchi (natural pool) is the perfect way to cool off after a good morning's stroll. Without a doubt the best way to spend an evening in Aruba is testing out the tucker and supping a cocktail or two after a good day spent outdoors. Most of the night life centres around the capital of Oranjestad however, head to the coast if you're looking to enjoy a truly tropical backdrop as the sun sets. Iguana Joe's, Garufa Cocktail Lounge and Mambo Jambo are all well-worth a look in if you're in the capital and further afield the likes of Senor Frogs and Moomba in Palm Beach and Charlie's Bar in San Nicolas are always popular and pretty much guaranteeing good times after lights out. Thanks to Aruba's mixed heritage you'll find no end of food, dance and costume party going on pretty much all year round however, it's the Bonbini (welcome) folk festival that takes place in the capital of Oranjestad that most people will probably experience on a first time visit to the island. Located just outside Fort Zoutman from 6.30pm - 8.30pm the Bonbini is a great way to spend a couple of hours being entertained and swaying your hips to the rhythm of the Caribbean amongst the shadows of the island's oldest recorded landmark. If you prefer your entertainment to be on a slightly more contemporary tip then the Soul Beach Music Festival is probably going to be your best bet as from R&B and international soul artists to DJ sets and comedy routines, May 21st to the 26th is all about the party vibe just south of Surfside Beach on the west coast. If the thought of yoga poses and walking trails fills you with dread or you're just looking to scream as you ramp things up a notch then an off-road Jeep safari might just foot the bill. This is an awesome way to see Aruba and find out more about the island's wildlife and natural habitats as well as discovering some of the best kept secret spots that only the locals know about. There's loads of different safari options to help you pick which you think would be the most suitable and from historical sites, such as the northern gold mines to natural formations, including the recently collapsed coral bridge, there's no better way to see Aruba than from the back of a 4x4. If you'd prefer to get fit on dry land then Aruba is tailor-made for cycling and walking tours with no end of suitable trails to take you far away from the beaten beach track. Mountain biking options are everywhere and there are numerous companies offering guided tours as well as full on safety gear with bike hire to help you explore the island on two wheels. Guided walks can be as cultural or as nature-based as you wish with plenty of landmarks (including the California lighthouse) always making good places to pause for thought and unwrap an Aruba picnic. If you're hoping to simply rest and relax then surely a morning or afternoon undertaking a few yoga postures has to be one of the best means of giving your body the love and respect that it deserves and if there's a better place to meditate then you'll want to keep it to yourself. If you prefer your days to be spent above the ocean rather than in it there are numerous paddle board and surf spots to help you work on your tan whilst catching the waves. Both options, as well as sea kayaking, kite surfing and wind surfing, provide an ideal means of keeping fit and seeing the world from a whole new perspective and even if you've never stepped on a board or held a paddle before you'll find numerous schools and hire companies to help you get started. Away from the ocean and there are loads of board and kayak tours to take you deep into the heart of mangrove country with the south of the island probably one of the best places for heading inland. Top waves: Check out the southern and the northern tips for the best beaches for surfing. Let's face it, there's only so long that you can stare at the warm waves of the Caribbean without wanting to dive in and as Aruba is considered to be one of the top dive spots on the planet, you're going to find a fair few ways to spend your time under the water. Aircraft, boats and coral reefs are all lying in wait below the surface and undertaking a PADI course will certainly be an experience to take away and remember for years to come. Aside from the SCUBA diving there's also Sea Trek which presents the chance to don a full-on diving helmet and take a stroll on the sea floor. Sea Trek is a great option for non-snorkellers/divers as you get to experience life underwater without even needing to swim. There are some seriously sensuous sandy spots in Aruba with the west coast, in particular, promising at least 7 miles of palm-fringed loveliness to get all hot and bothered about. Andicuri (mid-east coast), Baby (southern tip), Druif (west of Oranjestad) and Palm Beach (north west), are all well-worth a visit within their own right and hiring a car and touring the coastline is a great idea for discovering your own personal piece of paradise. Surfing, sunbathing, swimming or just snoozing, a day at the beach in Aruba is simply as good as it gets.